Interzone is a periodical I find delightful as much for its excellent nonfiction as its terrific fiction. David Langford’s “Ansible Link,” for instance, reports what’s going on in the speculative fiction community. It also provides information on how that community is viewed from outside in a section entitled, “As Others See Us,” usually pointing to something stupid said in the mainstream media about science fiction, fantasy or horror. My favorite bit has always been the section entitled “Thog’s Masterclass,” pointing out silly sentences in published fiction. “The Book Zone” is another great resource, with reviews and interviews of important fiction — much of it not yet available in the United States. In this issue, Maureen Kincaid Speller interviews Lavie Tidhar, the author of Osama — a book about a figure that one would think could not be written in a fictional manner (Speller says it’s on her “best of the year” list). Eight pages of book reviews are followed by five pages of film reviews, which in turn are followed by eight pages of reviews of DVDs and blu-rays. Even if the fiction were nothing but an afterthought, Interzone would be worth buying for its reviews. But the fiction is anything but an afterthought. 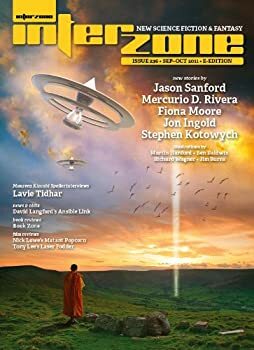 The best story in this issue is “Tethered,” by Mercurio D. Rivera. It is the story of a species that is unaccountably attracted to humans, attracted even against their will. For some reason humans make them feel especially good. Some members of the alien species believe this to result in a sort of slavery, so that the two species are secretly at war. Others give in to the servility that biology urges upon them. But at its base, the story questions whether true friendship is possible between two species with such an odd biological relationship. The story carefully works through all the consequences of the biology of the two species in a way that is the essence of sociological science fiction. I would not be surprised to find this story on award ballots next year. Jon Ingold’s “The Fall of the City of Silver” is a fantasy about Tarassos, an ancient Greek harbor city that was known to be rich in metal. In this story, the metal is silver, which confers such wealth upon the city that it was as “a glittering diamond resting on the blue silk cushion of the Aegean sea,” where people “lived in a luxury only the Gods did not envy.” The narrator, an eighteen-year-old girl named Euanthe, worries when her brother Olmos fails to come home one night. Olmos had always sworn that he would find adventure one day, traveling away from the city of his birth. But Euanthe does not believe that he has simply run away to sea. And when her father disappears as well, she determines to find out what has happened. In the process, she discovers more about her home than she would have chosen to know. I got far less from “The Ever-Dreaming Verdict of Plagues” by Jason Sandford than I might have if I’d read the story to which it is a sequel, “Plague Birds,” but alas, this issue is the first in my subscription. Despite coming in late, however, I still found the story to be fascinating. It depicts a world in which artificial intelligences have combined with biological hosts for various purposes; but the relationship between the species (if you will) has become such that the AIs exercise more control than they ought, and humans seem to be little more than their tools. I would love to read a novel set in this universe. “A Time for Raven” by Stephen Kotowych is about a man who sees no further reason to live until he is on the brink of death, and a man who suffers for his disobedience to ancient precepts. It is poetically written, at times almost prayerful. Fiona Moore’s “The Metaphor” posits a world in which every job has somehow become a role-playing game, until we no longer understand that we’re in a game; all we know is that there are rules that we must obey, tasks we must complete. What becomes of the relationship between the story and the storyteller, the story and the audience, when the audience is in the story? Metafiction or metaphysical contemplation, this story will send a chill up your spine. I first subscribed to Interzone years ago, and dropped it when I found I had too much to read and too little time. I’m delighted I decided to give it another chance, because this issue makes it plain that Interzone is worth making time for. This sounds like a great magazine!